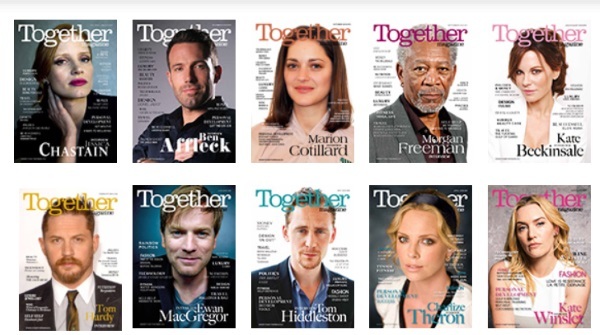 Home Celebrities Happy New Year from all at Together magazine! We would like to take this opportunity to wish you a Happy New Year and thank you all for your support throughout 2016. We look forward to a great 2017 in your company. The image above shows our covers and cover stars from the past year. They were: Kate Winslet, Charlize Theron, Tom Hiddleston, Ewan McGregor, Tom Hardy, Kate Beckinsale, Morgan Freeman, Marion Cotillard, Ben Affleck and, finally, our Christmas redhead Jessica Chastain.